Shopping for a camping coffee maker can be quite tricky. For that, we have written this guide that will help you choose the best camping coffee maker in regards to their best features. While we’re at it, we have thrown in a couple of coffee makers that we think are worth your hard-earned bucks. Let’s get to it! To make it easier for you to shop for your camp friendly coffee maker, we have listed some of the things that you should consider. One of the first things that you should look for while buying a coffee maker is the material used in manufacturing it. What you buy should withstand the demands of outdoor activities as they can be a little bumpy. Moreover, the material of the coffee also depends on the type of coffee it makes. For example, making a French Press requires a glass carafe. In this regard, you want a coffee maker that can stand up to the abuse and the harsh conditions of the great outdoors. You won’t expect something bulky in your backpack when you already have so many things to pack. So, when you buy the coffee maker, make sure it’s very lightweight and portable. The best thing we can advise is – stay away coffee makers that are made from really heavy metals unless you are exclusively doing car camping or glamping. Of course, this will depend on your needs. For lightweight backpacking, a lightweight coffee maker is a must. However if you’re car camping, a full featured coffee maker might not be that bad of an idea. This basically refers to the number of cups a coffee maker can produce in one go. While it’s always good to have as many cups as you can, you need to be wary of your weight savings. If you are looking for a camping coffee maker, you would like one with the capacity of multiple cups in one go. However, the more is the capacity, the heavier it may get. A good decision will be getting something according to the number of cups you need. For two persons, a low capacity coffee maker will be the most suited. The sooner that you can take that first sip, the better, won’t you agree? In that case, you will want a coffee maker that has a reasonable brewing time. And by that, we mean as fast as possible. Most camping coffee makers feature fast brewing time so you won’t have much difficulty with this one. However, take note that models that can provide for a big group will usually take a long time to complete a brew. In the morning in camp, the very first thing you would want is to stretch and enjoy your cup of coffee. So the last thing you would want is to work with a coffee maker that is a hassle to operate. Fortunately, most manufacturers ensure that their products can give that perfect brew with little to no effort. However, keep in mind that there are coffee makers that will require extra accessories to operate. And now we’re on to the good stuff. Below are some of the top rated camp coffee makers that you can buy. It’s safe to say that you can’t go wrong with any of these products. 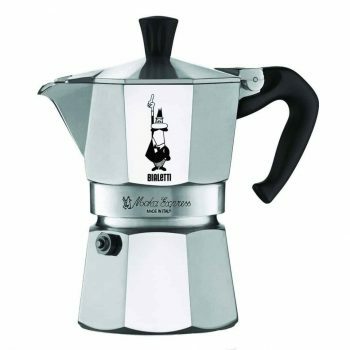 You will undoubtedly recognize the signature eight sided design of Bialetti Moka Express Espresso Maker; the brand’s unique pot has been seen on stovetops around the world since the early 1950s. Made in Italy and featuring a sturdy aluminum design, the Moka Express reflects Alfonso Bialetti’s original desire to “revolutionize the art of coffee brewing” without over complicating the process. You’ll be able to produce authentic Italian espresso in the great outdoors with this simple, stovetop pot in less than five minutes; just be sure to use a slight coarser grind than espresso ground coffee, to prevent blockage in the filter. It is easily disassembled for hand washing in warm, soapy water (be sure to dry it thoroughly afterwards before packing it up and hitting the trail), and it comes with a two year warranty to ensure that it will perk up hundreds of groggy mornings at the campsite. Related: The Cuisinox Roma Stovetop Coffeemaker is a good alternative if you require an ergonomically designed, stainless steel espresso maker with a heat resistant handle that can be popped into the dish washer for easy cleaning. 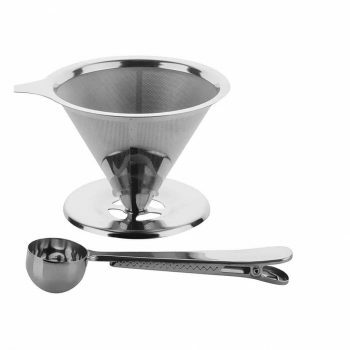 Made up of 18/10 stainless steel, it supports the Classic Italian method of brewing espresso. Includes 1 extra gasket and reducer included. You’ve probably seen the ultra hip pour over coffee brewing method at the coolest coffee shops in your neighborhood. With Coffee Gator Pour Over Coffee Maker, you experience exactly the same. This slow brewing process uses a gentle, steady stream of perfectly heated water to tease out the best aromas, oils, and flavors of the grounds… and holding up the wait at the shop for whoever is behind you in line. But there’s a reason this method has become so popular: pour over brewing offers a brighter and cleaner taste than the traditional French press method, and is relatively easy to brew and clean. Also, the patience required to brew a pot of pour over coffee isn’t such a big deal under the wide open skies of our campsite as opposed to a busy coffee shop full of cranky commuters. This model does not require paper filters, instead using an environmentally friendly reusable laser cut steel filter for each brew. This affordable coffee brewing system is a simple, yet high quality choice for the most demanding campground coffee connoisseurs. 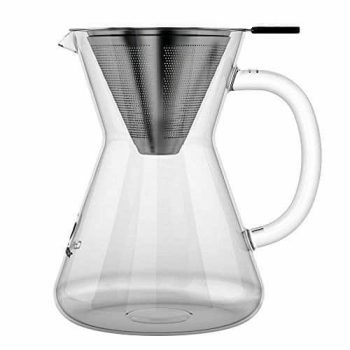 Related: If you require a different pour over model, the Vescoware Pour Over Coffee Kettle ensures that you will end up with perfectly brewed coffee every time. Thanks to the smooth water flow of the gooseneck spout and the built in temperature gauge. On one side the simple, efficient French press method is a favorite for coffee drinkers at home or on the camp site. On the other side, the Primula Classic Coffee Press is the perfect pot to go from the comfort of your kitchen to the rustic beauty of the campground and back again. This high quality pot is constructed of sturdy, temperature safe borosilicate glass, and requires no filter. The mesh on the end of the plunger is all you need to separate the hot water from the grounds to produce a perfect cup. Coffee is fully brewed in a quick four minutes — just enough time for you to wake up the other members of your party with the tantalizing smell of brewing beans. And when you’re not on the trail, the pot of this coffee maker fits securely into the side of most refrigerator doors so you can save your leftovers for an afternoon glass of refreshing iced coffee. Satisfy two to four cranky campers with this generous French press, which is perfect for the coffee aficionado who only occasionally ventures into the great outdoors. The carafe of this press can fit easily into the side door of a refrigerator for storage, and is also dishwasher safe, making it perfect for home use as well. Related: The Cuisine Trend French Coffee Press is a good alternative. You can brew professional grade coffee or tea, without letting the coffee ground escape the filter system. It’s a premium quality French coffee press which seems reliable enough for long term use. The Open Kitchen Pour Over Coffee Dripper proudly boasts that it will provide you with the best tasting coffee for years to come, whether you’re brewing in the comfort of your own kitchen or by the fragrant smoke of a campfire. The construction of this coffee maker has the chops to back it up: a laser cut 18/10 stainless steel double filter provides optimal flavor while keeping grounds at bay, and the simple pour over method has been proven to yield some of the best tasting coffee around, regardless of your location. The filter of this coffee maker is highly versatile; it can be placed atop almost any receptacle – be it a mug, thermos, or small pot – so that the coffee can flow freely into your container of choice without spilling a drop. The dripper can either be hand washed at the campground or thrown in the dishwasher once you arrive back on the grid. Related: The LINKYO Pour Over Coffee Maker is a slightly more expensive coffee maker that you can use to brew in your camp. The cone stand features silicon ring which is wide enough for most of the mugs. You can simply rinse it with warm water or wash it with a dish soap to keep it clean. Plus you get 2 years warranty after registering the product. 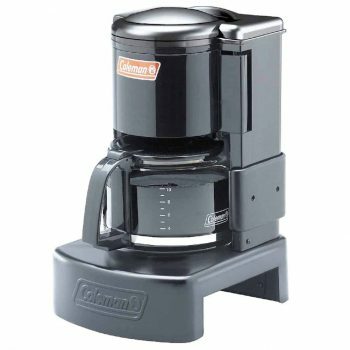 If you’re looking for a high quality, dedicated coffee maker to take along whenever you venture outdoors, look no further than the Coleman Camping Coffeemaker. Made specifically to fit atop a camping stove, this durable coffee maker produces classic drip brew coffee, but can also make hot cider, tea, cocoa, or instant soup should the occasion arise. The solid steel base can easily handle the heat of being placed directly on a camp stove burner, and this high yield coffee maker can dish out up to ten 6 ounce cups of steaming hot brew on a cold morning. The thoughtful design of this coffee maker ensures that it will be mess free, thanks to an easy pour carafe and the pause and serve feature, that enables you to pour a cup while the pot is still brewing (hey – if you got up to make the coffee, then you should get the first cup, right?). It would take about 10 minutes to brew from start to finish. Related: Want some frothed milk for your camp cappuccino? The Morhet Electric Milk Frother relies on the power of hand blending to bring you freshly brewed coffee in minutes, and utilizes “perfect flow” technology to ensure that you’ll have your morning cup even in the most extreme conditions. 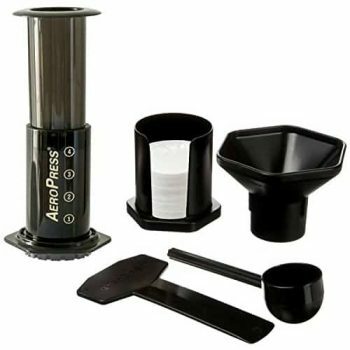 Designed by inventor/engineer Alan Adler – whose Aerobie flying ring achieved the Guinness World Record for World’s Farthest Throw at 1,333 feet – he spent years of research and testing to produce the AeroPress Coffee Maker. This high tech coffee maker was built to address what Adler believed were the keys to great tasting coffee: proper temperature, total immersion, and rapid filtering. This lightning fast coffee maker can brew 1 – 4 cups of coffee in a mere minute and change, and this quick brew time results in low acidity and higher quality taste. When you’re at home and near the fridge, he pure, particle free brew that this coffee maker yields can be stored for days as a concentrate for iced coffee and other beverages. As far as options are concerned, it doesn’t get better than the AeroPress: you can either brew regular coffee or shots of espresso, all from the convenience of the campground. Related: For car campers that require heavy duty brewing, the Keurig K250 Pod Coffee Maker is a great buy. It is a compact coffee maker that can be fully cleaned with a quick rinse of the plunger. This sleek and slim coffee maker includes 4 K cup pods and a bottle of descaling solution that extends the life of the brewer. When you don’t want “roughing it” to apply to your morning cup of joe, grab the Idylc Homes Kona French Press Coffee Maker before you hit the trail. This well constructed French press is portable, easy to clean, and entirely camp friendly, and capable of producing barista level quality coffee, espresso, or tea when there isn’t a Starbucks for miles around. The three piece stainless steel infuser filter system can stand up to years of use while never compromising flavor, and the borosilicate glass carafe is made to withstand the lumps and bumps of campground life. And when warm weather camping trips make hot coffee seem almost unpalatable, this press can easily adapt to service cold brew coffee or iced tea. This French press coffee maker is easy to clean; the detachable stainless infuser filter system is entirely dishwasher safe, meaning you can thoroughly sanitize the entire mechanism before your next outdoor adventure. Related: You can buy the Zestkit French Press Coffee Maker too along with this product. It serves 1 liter of coffee, which is about 8 cups of French coffee, tea, espresso and even cold brew. The 4 level filtration system seals the edges so that you can get sludge and coffee grounds without losing the essence. 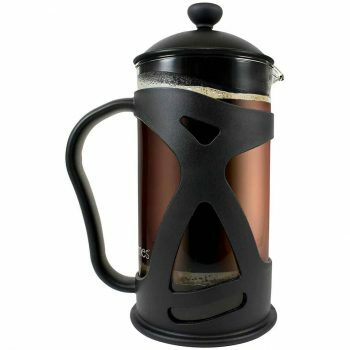 The French press has a good reputation for a reason: it’s quick, it’s easy, it’s portable, and it makes a darn good cup of coffee. The SterlingPro French Press Coffee Maker is no exception to the French press rule, and this durable option is ready and willing to deliver a steaming hot liter of freshly brewed coffee to you and your fellow campers in just a few minutes. Unlike some French presses that let those dreaded grounds slip past the filter, the SterlingPro offers a unique double screens system that ensures your morning cup with be 100% grounds free. In fact, this press comes complete with two extra replacement filters to ensure you are keeping grounds at bay while allowing the optimal flavor of your beans to shine through. The carafe of the SterlingPro is made of heat resistant borosilicate glass, and the attractive design of this French press will earn it a prized spot both in your pack and on your kitchen counter at home. 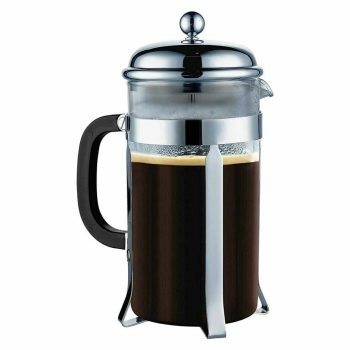 Related: The Coffee Gator French Coffee Press is one of the products that comes to the notice of buyers while buying this coffee maker. Unlike the other glass versions that are rather flimsy, users find it highly reliable and durable. The coffee maker is rust proof and heat resistant which makes it a good outdoor brewer. If you’ve ever owned or shopped for a French press, chances are you’ve come across the brand name of Bodum; the manufacturer has made a name for itself in the French press business, and its products live up to the buzz. 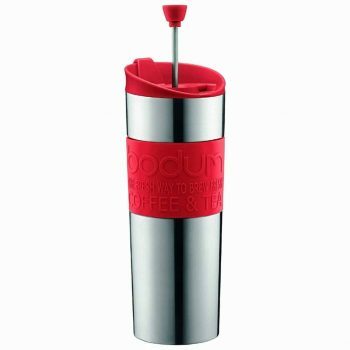 Now, Bodum has transformed the popular French press into a convenient single serve travel mug: the Bodum Travel Coffee Press allows you to add coarsely ground coffee, pour hot water, seal the lid, and then you’re free to go. Four minutes later, you’ll be able to press down the plunger and enjoy a perfectly brewed single serve portion of rich French press coffee. The coffee stays warm for hours thanks to the vacuum sealed, double walled stainless steel construction. Not in the mood for coffee? This coffee maker can also brew you a perfectly steeped mug of fresh, hot tea on the go. Either way, if you want your morning beverage to be fresh, convenient, and on the go, this is the system for you. Related: The Starizzo French Press Coffee Maker is a handy choice for a clumsy camper, with its durable borosilicate carafe, Santoprene and polycarbonate frame, and steel plunger. 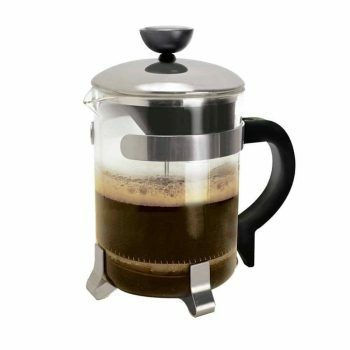 If you want to enjoy freshly brewed coffee with less steps and stress, this coffee press works the best. The coffee maker is neither too large nor too small and works perfectly for brewing 2 cups of coffee. When you’re more than happy to leave the comforts of home behind but can’t imagine starting the day without a hot cup of caffeine, you’ll need a sturdy, portable option to tote along for your outdoor adventures. Luckily for our coffee and tea obsessed culture, today’s manufacturers are well in control of our demands, and have provided a heap of options to suit every camper’s needs. Do you have a camping coffee maker you swear by? Has a particular make or model saved your fellow campers from witnessing your before coffee demeanor? Tell us all about it in the comments!